A winning combination of its many fine components. J (newcomer James Frecheville) is an 18-year-old boy thrust into the midst of his criminal extended family when his mom ODs and dies. Mom had shielded the boy from her sketchy mother and brothers, but with nowhere left to turn young J reaches out to his grandma, colorfully nicknamed Smurf (Jacki Weaver). Smurf welcomes him into her home with open arms and he sets about integrating himself into his extended family while also attempting to keep his shady uncles at arm's length. When one of his uncles is unlawfully gunned down by cops, his other uncles recruit him in their plan for retaliation. That plan is spearheaded by J's craziest uncle, Pope, quite literally insane and off his meds. Where will J's true alliance end up: with the untrustworthy cops or his criminal clan? This little Australian film garnered some attention a year ago when it won an award at Sundance, and further bolstered its prestige today with a Best Supporting Actress Oscar nomination for Jacki Weaver. So is the attention deserved? Yes, the film is definitely worth a look, although I didn't find anything particularly Oscar-worthy about Weaver's performance. She plays a fairly minor role, and she plays it well, but nothing that memorable or exceptional. Perhaps it's just the nature of her role, as it is an interesting character: the sweet but tough-as-nails crime family matriarch who stands by her wicked boys regardless of their evil intentions. Or maybe it's just her character's catchy nickname. In any event, I found the sum of this film as a complete experience to be much greater than its individual roles. Writer/director David Michod really nails J's tense and desperate situation with a stark, bleak realism that never glorifies the frequent violence. Murders happen lightning-fast, just quick gunshot pops and blood splatter with no forewarning or lingering camera shots. This matter-of-fact presentation is accentuated by the actors playing the creepy uncles, all convincing in their uninhibited portrayals of ne'er-do-wells. Frecheville's inexperience as an actor also benefits the film as he and his character are forced to deal with completely alien situations for the first time. Guy Pearce also appears as a police inspector attempting to woo J to testify against his clan, contributing a fine performance as the world-weary but driven cop determined to help J and find justice. The score by Antony Partos is hauntingly effective, with sparse, foreboding cues that greatly add to the film's sinister air. The film is a winning combination of its many fine components. 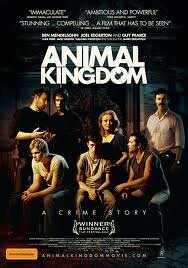 Animal Kingdom is now available on DVD and Blu-ray.